The exhibition ‘Material Evolution: Ugandan Bark Cloth’ at the University of North Texas featured international artists and designers who create artistic works and everyday functional items from bark cloth, focusing on creating sustainable and environmentally friendly design solutions from a centuries-old process. 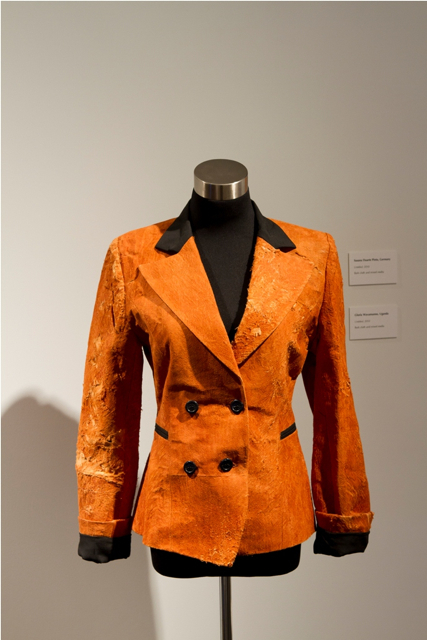 This exhibition showed how bark cloth made from the Ugandan mutuba trees can be used to create commonplace items such as men’s shoes, a jacket and a bark cloth-wrapped steering wheel. 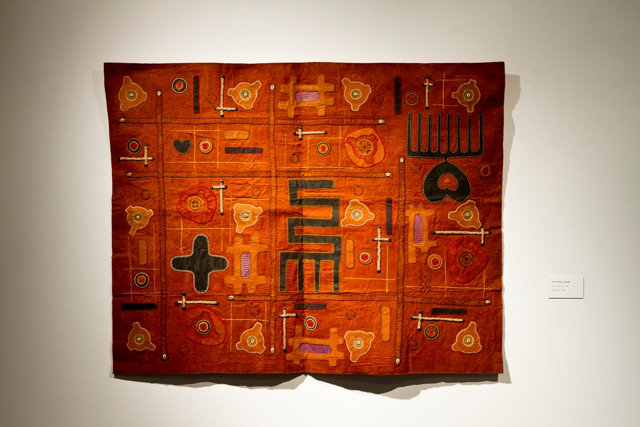 Other featured items included artistic works such as wall coverings made of bark cloth and a bark-cloth dress used in contemporary Ugandan wedding ceremonies. 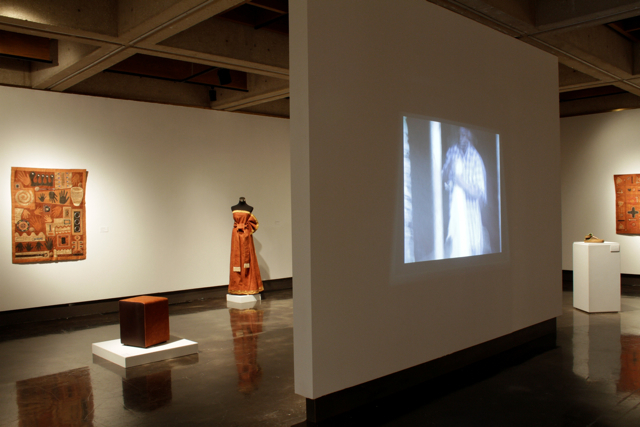 The items were on display from March 1st – March 26th at the UNT Art Gallery at the University of North Texas. Startjournal.org’s Thomas Bjørnskau has interviewed Lesli Robertson, the curator of the exhibition. Start: First of all, why did you choose to put up an exhibition with Ugandan bark cloth art and clothes? Lesli Robertson: I have been fortunate enough to have traveled to Uganda for various research projects since 2005. Each trip I would continue to discover more and more about bark cloth, each element of the story surrounding it became very intriguing. When I would come back to the States from the trips, I began to look for more information, articles, books, etc that highlighted bark cloth and rarely found anything published past the 1970s. I thought that since there was so much going on in Uganda and abroad with the cloth, especially as it relates to art and design, I would propose a project to bring these works and this story to a new audience. With the support of the University of North Texas and the Dallas Museum of Art, I was able to begin working on the development of this exhibition and concurrent projects. 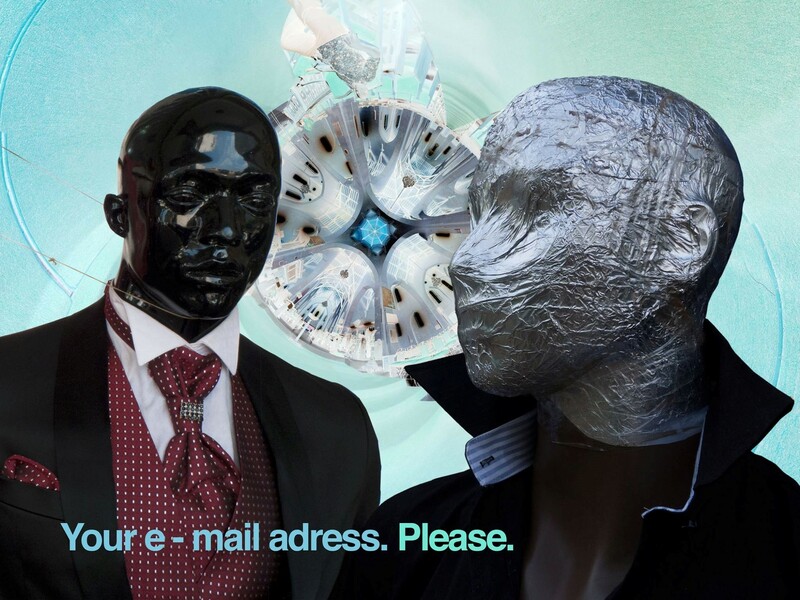 Start: How was the response from the audience to the exhibition? Were you in any way surprised by the feedback you got from the viewers? LR: We received overwhelming response about this exhibition. Tracee Robertson, UNT Art Gallery director, said that she heard viewers describe the exhibition as “moving” and “eye-opening”. It seems that the audience was able to engage with a material in a new way; being able to see the process of stripping the tree and pounding it into a supple cloth brought an appreciation of the uniqueness of the bark. The video interviews with artist, designers, and scholars enabled viewers to sense the individual nature of all the works, and seemed to bring a greater appreciation of the importance of using this material. Yakuze Ivan, Uganda HIV Awareness, 2008. Bark cloth collage. Start: What is so fascinating with bark cloth compared to other fabrics? LR: I would have to say that no other textile I am aware of has such a transformation from bark to cloth. I enjoyed seeing viewers be amazed as they watched the tree being stripped and pounded, resulting in a cloth that is so soft and so versatile. In addition, bark cloth has the ability to function in so many spheres, as a cultural material, as tourist products, as fine art, and as experimental design. Each life it seems to hold does not diminish its importance in other realms; it only strengthens what this material can become. Gloria Wavamunno, Uganda Untitled, 2010. Bark cloth and mixed media. Start: How are the ideas around sustainability been received in your community? LR: As in most of the world, the term green is becoming an everyday word. So as you approach art and design, so many people are looking to do their part to contribute to building nature, not tearing it down. 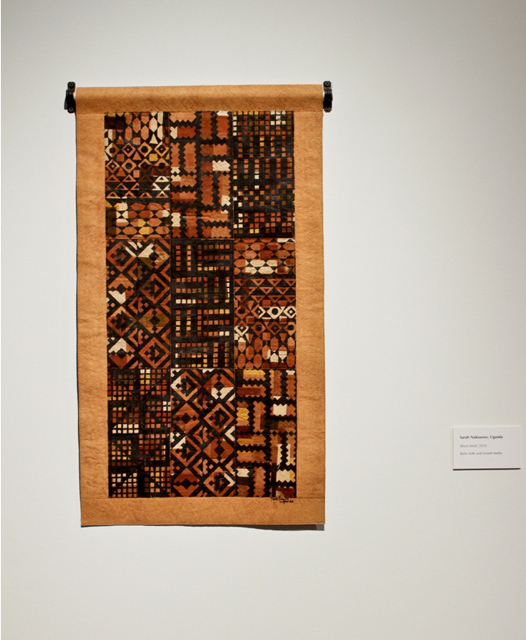 Because bark cloth is a sustainable material, it was very well received in our local community and many artists, who viewed the exhibition, expressed an interest and desire to create with it – because it is a “green” material. We held a workshop at the university with German/Ugandan design team from BARKCLOTH Europe, Oliver and Mary Barongo Heintz. We invited local artists, designers, and students to explore this material; everyone was educated on its organic nature and how designers from abroad are experimenting with it in their sustainable designs, igniting some creative fires with the participants. 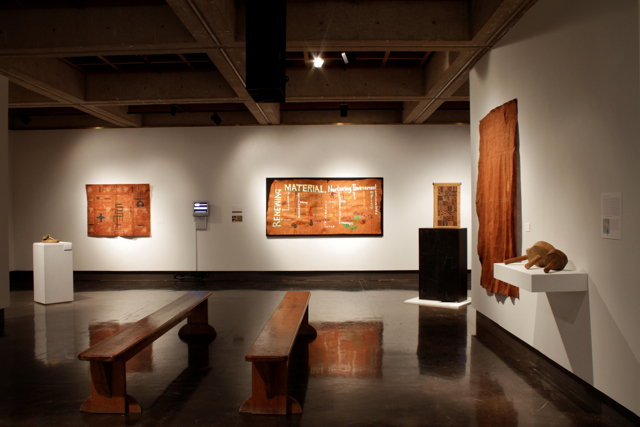 Start: This exhibition has showed bark cloth art from artists all around the world. Are there any differences in the way Ugandan artists use this material compared to European or American artists? 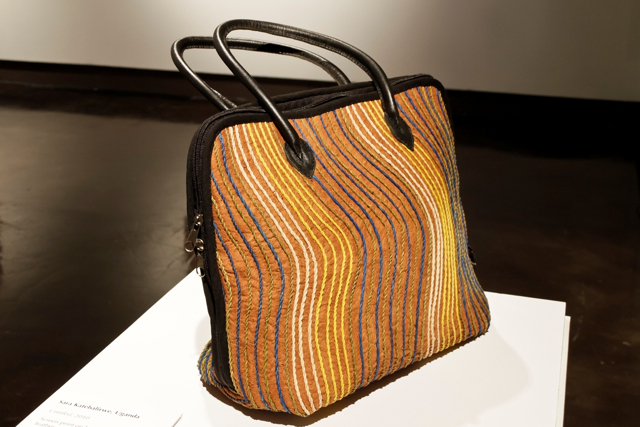 Nakisanze Sarah, Easy Afric Designs, Uganda Block Motif, 2010. Bark cloth and mixed media. Start: Finally, are there any plans for future events to follow up this exhibition? LR: The exhibition was the final stage of a three year project, so after a good long rest I will evaluate which direction to go so I can help in the promotion and preservation of this wonderful tradition. There are so many great things that are happening with bark cloth. Lesli Robertson, who is a faculty fellow in UNT’s Institute for the Advancement of the Arts, has traveled to Uganda several times in the last few years to study the process of making bark cloth. Also in the last few years, Robertson has organized various community projects to engage schoolchildren in Uganda and the United States in an exchange of artistic ideas. A mural created by those schoolchildren will be on display in the March exhibition. All photos are courtesy of the University of North Texas Art Gallery; photography by Matt Golden. The show was amazing! Lesli did a wonderful job of curating and informing the audience about the possibilities that lay within barkcloth as a material! Hi thank you for documenting and bringing to us such an insight on the Barkcloth and the places its going! I think it’s one of the heritage’s i’m proud to be part of both as a Ugandan and an Artist. I believe that we can also discover more traditional and natural materials e.g Natural dyes to use in our work that could carry along a piece of Uganda/Africa when they are exhibited! Thanks alot.